(SUDBURY, ON) – Each year, students from local schools bring their science projects to the regional science fair to share the science experiments, studies and innovation projects that have taken weeks and, in some cases, even months to perfect. It is quite fitting that in its 50th year, the Sudbury Regional Science Fair was held in the new Cliff Fielding Innovation, Research and Engineering building at Laurentian University. Student projects lined the hallways of this bright and modern building and engaged with professional scientists, engineers and the general public. 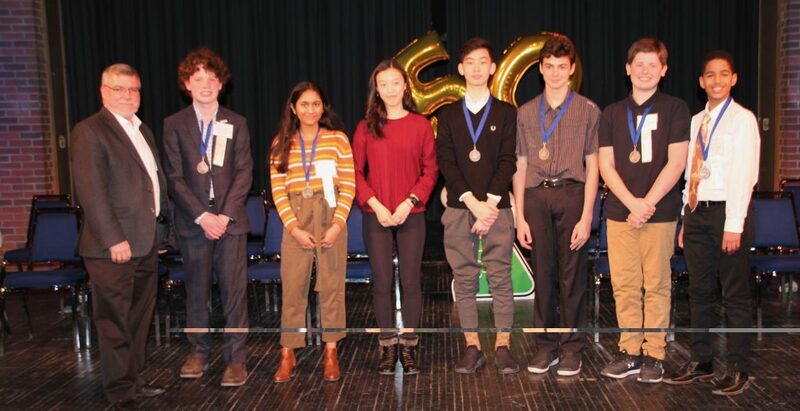 The 50th annual Sudbury Regional Science Fair (SRSF) was a big success for the 52 projects and 76 participants from 18 schools who took part in the competition held at Laurentian University on April 6 and 7. The projects, which showcased a variety of scientific initiatives, were judged by over 60 professional scientists from the local area. Over 60 professional scientists and engineers played an important role in the Regional Science Fair. These individuals judged the projects for 22 regular awards and 35 special awards. “The support we get from science professionals from across the disciplines through the judging process adds great value to the student experience,” added Chief Judge Dr. Hélène Joly. The highlight of the awards ceremony on Sunday April 7 was the designation of those who will represent the region at this year’s Canada-Wide Science Fair to be held in Fredericton, New Brunswick from May 11 to 18, 2019. Brendon is one of eight students from across Canada chosen to attend the Intel International Science and Engineering Fair that will be held in Phoenix Arizona at the exact same time as the Canada-Wide Science Fair. The Sudbury Regional Science Fair would like to congratulate Brendon and wish him well as he competes at the international level. For the fifth year, the Sudbury Regional Science Fair Committee presented an award recognizing a teacher from Le Conseil Scolaire Catholique du Nord de l’Ontario as a science ambassador. Mme Anne Ross-Boudreau, from Ecole Jean-Paul II in Val Caron was recognized for her passion for science. She is known for teaching fun and engaging science activities not only for her class but the entire school. She is recognized for influencing students in pursuing their studies in science in high school and beyond and is even said to have played a role in her students’ STEM career choices. The Sudbury Regional Science Fair (SRSF) offers hands-on science experiences to students from grades 7 to 12. It wishes to encourage teachers to use project-based science in the classroom to get students interested in science. This experience connects students to professional scientists whether through mentorship of their project or through the judging experience at the fair. Since its inception in 1969, approximately 5,280 students have participated at the regional science fair level and 287 students have had all expense paid trips to the Canada-Wide Science Fair.